Jefferson grew up in Virginia and was raised with the orphaned children of his father's friend, William Randolph. He was educated from ages 9-14 by a clergyman named William Douglas from whom he learned Greek, Latin, and French. He then attended Reverend James Maury's School before attending the College of William and Mary. He studied law with George Wythe, the first American law professor. He was admitted to the bar in 1767. Jefferson was the son of Colonel Peter Jefferson, a planter and public official, and Jane Randolph. His father died when Thomas was 14. Together they had six sisters and one brother. On January 1, 1772 he married Martha Wayles Skelton. However, she died after ten years of marriage. Together they had two daughters: Martha "Patsy" and Mary "Polly." There is also speculation about the progeny of several children by the slave Sally Hemings. Jefferson served in the House of Burgesses (1769-74). He argued against Britain's actions and was part of the Committee of Correspondence. He was a member of the Continental Congress (1775-6) and then became a member of the Virginia House of Delegates (1776-9). He was the Governor of Va. during part of the Revolutionary War (1779-81). He was sent to France as a minister after the war (1785-89). President Washington appointed Jefferson to be the first Secretary of State. He clashed with Alexander Hamilton, Secretary of the Treasury, on how the US should deal with France and Britain. Hamilton also desired a stronger federal government than Jefferson. Jefferson eventually resigned because he saw that Washington was more strongly influenced by Hamilton than him. 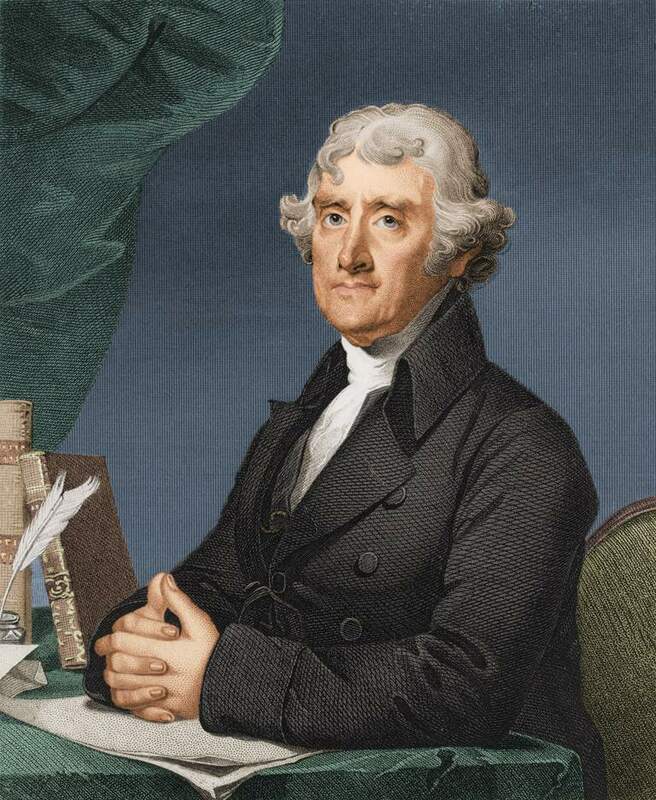 Jefferson later served as Vice President under John Adams from 1797-1801. In 1800, Jefferson was the Republican candidate with Aaron Burr as his Vice President. He ran in a very contentious campaign against John Adams under whom he had served as Vice President. The Federalists used the Alien and Sedition Acts to their benefit. These had been vigorously opposed by Jefferson and Madison who had argued they were unconstitutional (Kentucky and Virginia Resolutions). Jefferson and Burr tied in the electoral vote which set up an electoral controversy described below. Even though it was known that Jefferson was running for President and Burr for Vice President, in the election of 1800, whoever received the most votes would be elected as president. There was no provision that made it clear who was running for which office. Burr refused to concede, and the vote went to the House of Representatives. Each state cast one vote; it took 36 ballots to decide. Jefferson won carrying 10 out of 14 states. This led directly to the passage of the 12th Amendment which corrected this problem. Jefferson was renominated by caucus in 1804 with George Clinton as his Vice President. He ran against Charles Pinckney from South Carolina. During the campaign, Jefferson easily won. The federalists were divided with radical elements leading to the party's downfall. Jefferson received 162 electoral votes vs. Pinckney's 14. The uneventful transfer of power between Federalist John Adams and Republican Thomas Jefferson was a significant event in American History. Jefferson spent time dealing with the federalist agenda with which he did not agree. He allowed the Alien and Sedition Acts to end without renewal. He had the tax on liquor that caused the Whiskey Rebellion repealed. This reduced government revenue leading Jefferson to cut costs by reducing the military, relying instead on state militias. An important early event during Jefferson's administration was the court case, Marbury v. Madison, which set up the Supreme Court's power to rule federal acts unconstitutional. America engaged in a war with the Barbary States during his time in office (1801-05). The US had been paying tribute to pirates from this area to stop attacks on American ships. When the pirates asked for more money, Jefferson refused leading Tripoli to declare war. This ended in success for the US who was no longer required to pay tribute to Tripoli. However, America did continue to pay to the rest of the Barbary States. In 1803, Jefferson purchased the Louisiana territory from France for $15 million. This is considered the most important act of his administration. He sent Lewis and Clark on their famous expedition to explore the new territory. In 1807, Jefferson ended the foreign slave trade beginning January 1, 1808. He also established the precedent of Executive Privilege as explained above. At the end of his second term, France and Britain were at war, and American trade ships were often targeted. When the British boarded the American frigate, Chesapeake, they forced (impressed) three soldiers to work on their vessel and killed one for treason. Jefferson signed the Embargo Act of 1807 in response. This stopped America from exporting and importing foreign goods. Jefferson thought this would have the effect of hurting the trade in France and Great Britain. However, it had the opposite effect, hurting American trade. Jefferson retired after his second term as president and did not reenter public life again. He spent time at Monticello. He was deeply in debt and in 1815 sold his library to form the Library of Congress and to help get him out of debt. He spent a lot of his time in retirement designing the University of Virginia. He died on the fiftieth anniversary of the Declaration of Independence, July 4, 1826. Ironically, this was the same day as John Adams. Jefferson's election began the fall of federalism and the Federalist Party. When Jefferson took over the office from Federalist John Adams, the transfer of power occurred in an orderly manner which was an extremely rare event. Jefferson took his role as party leader very seriously. His greatest achievement was the Louisiana Purchase which more than doubled the size of the US. He also established the principle of executive privilege by refusing to testify during the Aaron Burr treason trial.